I’m working on a project tonight. It’s been awhile since I’ve made anything. I’ve been spending time working on other projects for a little while, like painting furniture and reading books. Oh, and cleaning my office. The disorganized state of my space really made me feel like I couldn’t make anything. Now it’s in pretty good order, and I feel free to create again. 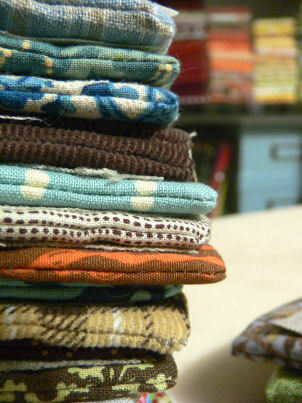 So tonight, I’m working on a stack of… well, I’ll show you when I finish them. Oh, I also spent a bunch of time last week taking photos and updating the shop. I’ll be stocking new items in there this weekend, too. When I went to get out my snaps to finish off this pretty stack of card wallets, I discovered I only had 3 heavy duty snaps left. And they’re apparently not so heavy duty anyway. The first one I installed broke off the first time I tried to pull it open. Anybody got a good heavy duty snap recommendation? Update: Nevermind. My heavy duty snaps are just poor excuses for snaps. I tried with some simpler pearl snaps, and every wallet is now finished, and plenty sturdy. First dibs at tomorrow’s farmer’s market. Second dibs on the website probably on Sunday. Pouches made with osnaburg fabric and appliqued with bunting, trees, or owls. 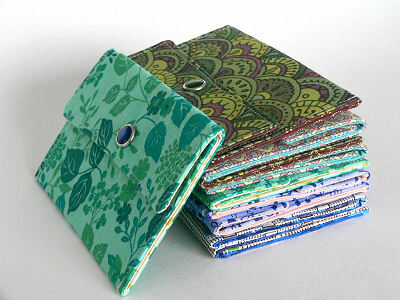 This week I plan on making some more card wallets and maybe some new bags. I seem to have a hard time getting started on projects when I come home from a long day of work, so we’ll see how that actually goes. I spent some time this morning taking advantage of the sunlight and taking photos of little hootie owls. After looking at them, though, I think I need to redo the whole thing. I think I set the exposure too high, and everything looks a bit washed out. I did get one lovely photo, though. 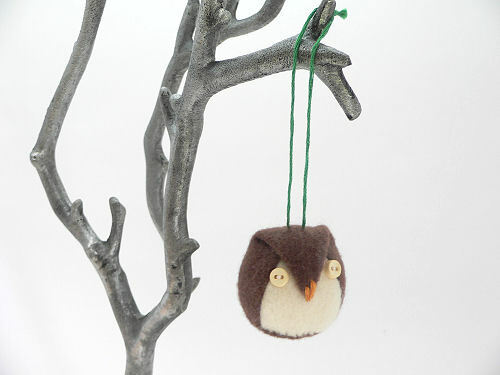 This little hootie owl hanging in a metal tree I found at Joanne Fabrics last fall. Now it’s back to the light box, to try to get some truer colors. Wish me luck! or better yet, share some tips with me for getting great photos, because I’m often underwhelmed with my photos. What are your secrets? UPDATED: I retook all the photos with a lower exposure, and everything looks much better. I listed the whole flock of owls on Etsy. 2011 already? What happened? And on that note, where have I been? I haven’t posted since September, at which time I promised to get better about blogging. So much for promises from me. But it’s a new year now, and that almost requires making new promises. So, once again, I’m going to try to be a better blogger. And I’m going to start updating my Etsy shop again. Pop on over now and see all the new things I listed today! As for where I’ve been, it’s a fairly simple story. Back in July I got a new job that ate up way too many hours. 12 hour days and almost 2 hours a day driving to and from work were not uncommon. So just before Christmas, I started a new job, with shorter days and a much more reasonable commute. And I can already see a difference. 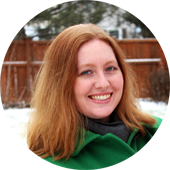 Hopefully, blog readers and shop visitors will begin to see one, too! 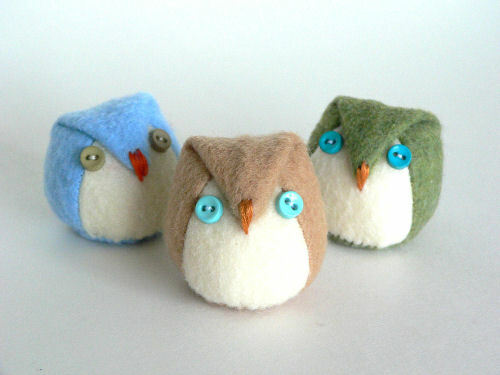 A new flock of Little Hootie Owls in shades of brown, green, and blue has flown into the Etsy shop. New to the group are the light brown owls, and I think they make a great addition to the more natural looking owl colors. Isn’t is lovely? I thought it was time for Anodyne Design to get a more identifiable and consistent image, and I really think this will do the trick. 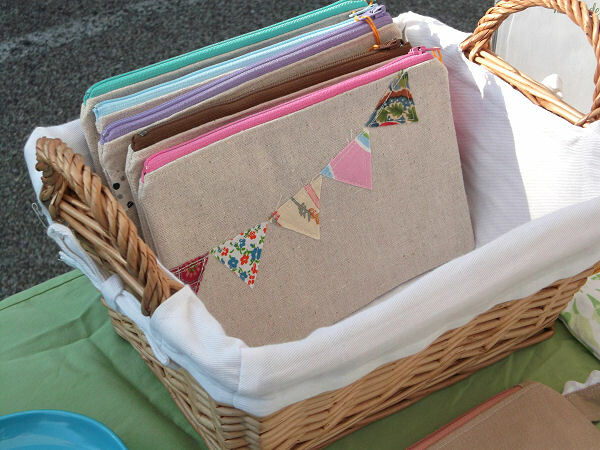 The marvelous work was done by Amber of a. mabe design. I’m creative, but by no means a graphic designer. It was a pleasure to work with someone as talented and professional as she is. I can’t say enough nice things about her or the logo. It’s nice to be so happy with something! 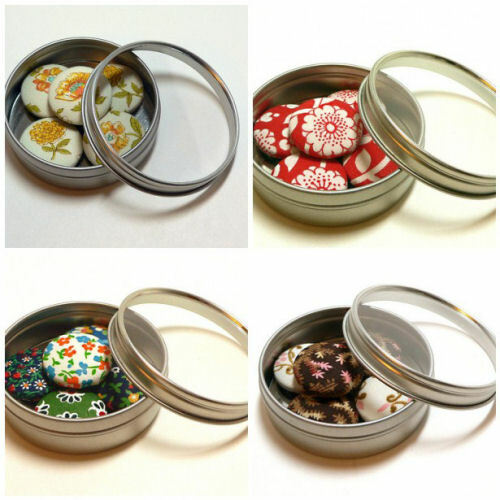 Tonight I added some new sets of button magnets to the Etsy shop. 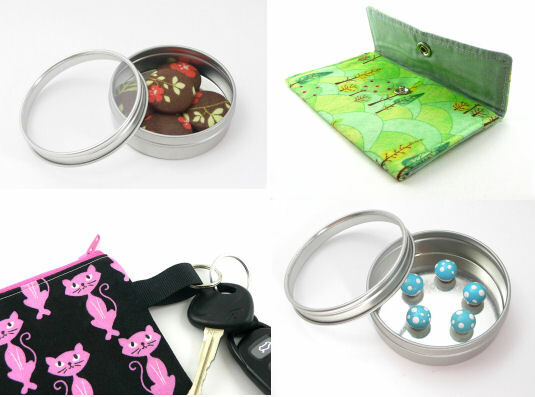 Each set contains five magnets covered with either matching or coordinating fabric. They’re cute and practical. These are the types of magnets I use in my own kitchen, so I know that they’re strong and will last. 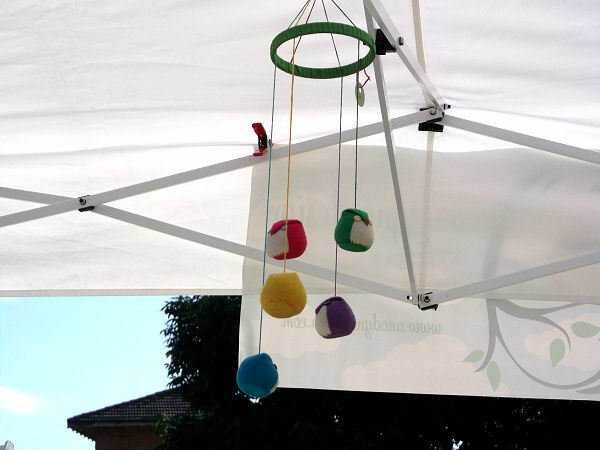 We tend to use magnets to hold up more than one thing at a time around here, and these ones are up to the challenge! 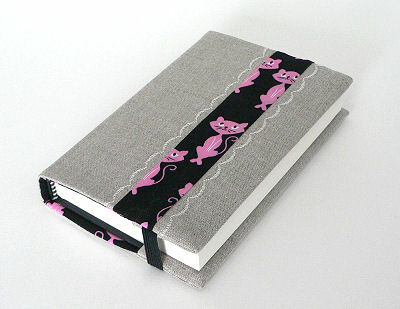 I put the finishing touches on a batch of 10 new fabric journal covers today, and have started adding them to the shop. I love all the different fabric, and I changed up the decorative stitching on the covers to better coordinate with the accent fabrics. I especially love the scalloped edges I used on a few (and it felt good to use a mostly neglected feature on my sewing machine!) I will be adding more of these little lovelies to the shop throughout the week. I made another stack of wallets. There’s something so satisfying to me to see a stack of matching items together. I’m not exactly sure what it is, but it makes me happy. So of course I needed to photograph the stack. 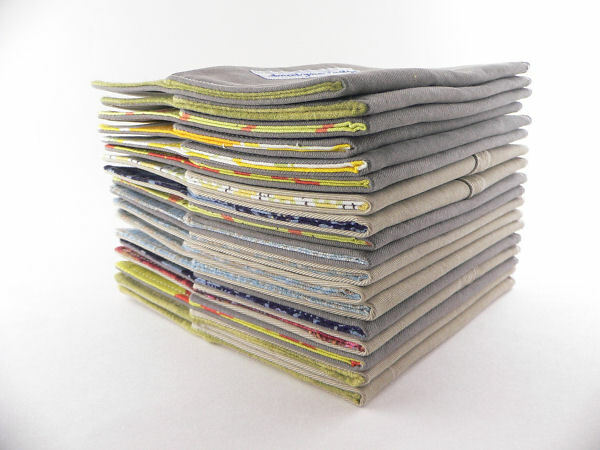 A fresh stack of card wallets. Doesn’t the group just look so nice? I’m also loving the different colors of cowgirl snaps I used on the wallets. It’s so nice to have options now, instead of just the plain pearl and silver for everything. 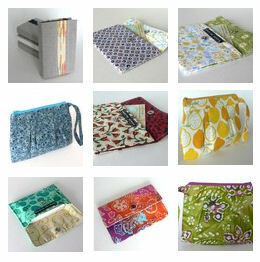 Just FYI: I’m listing these wallets in my Etsy shop, in case one strikes your fancy.